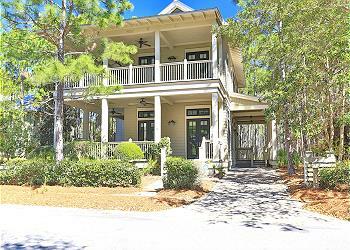 DETAILS: Coastal charm abounds in this amazing cottage for 12 located in the Camp District. You will find beautiful wooded views are abundant here with the home's beautifully furnished porches. Once inside, the neutral colors and beautiful woods make this cottage feel like home. The living room with fireplace also boasts a wall-mounted flat screen TV and DVD player, and the open floor plan gives room for large groups to enjoy time together. The well-appointed kitchen offers granite counter tops, stainless steel appliances and marvelous creamy, white cabinets. One relaxing king bedroom is located downstairs. It comes complete with it's own adjoining bath with tub, shower, and a single vanity. Upstairs you will find the light and airy master bedroom suite with king sized bed, TV/DVD, and tiled master bath featuring a tub, walk in shower, double vanity, and an amazing walk-in closet. This room includes a private screened in balcony with oversized swing bed. Just down the hall, a coastal chic queen room awaits. Beautifully decorated with a coastal flair, you will feel relaxed in this queen room with adjoining bath which features a single vanity, tub and shower. Also upstairs, you will find a private bunk room with one set of bunks, complete with a sliding farmhouse door! This floor also features a queen sleeper sofa as well as a twin daybed with a trundle! This room has a convenient adjoining bathroom with a single vanity and shower/tub combo. This home was fabulous! We had 4 adults and 6 kids and we had plenty of room. The decor was lovely, beachy and the corn hole on the porch was so fun for the kids and adults. We loved riding our bikes to dinner and to the beach. We were close to Camp Watercolor, the soccer field and basketball court. We loved it so much that we'll be coming back again!! Felt like home for Thanksgiving! We had an amazing time in Watercolor. 102 Red Cedar Way was a perfect fit for our family and the house had all the amenities that made it feel just like home. Great job to the owners for amazing decorating abilities to make our stay so cozy. We are so delighted that you and your family enjoyed your vacation with us in Watercolor! We loved the amazing group photo you shared with us! Thank you for choosing 360 Blue, we hope to see you again! Great home and we had a wonderful stay ! Thank you for choosing 360 Blue! We hope to see you back at the beach soon! Amazing weekend!!! Property was magnificent. Our first time staying, can’t wait to return! We thoroughly enjoyed having you as our guest for your inaugural Emerald Coast vacation! We are thrilled that you enjoyed your stay and look forward to having you back soon!